CityTalk | C0: Should Public Funding Be a Last Resort? C0: Should Public Funding Be a Last Resort? The opening panel of the finance forum provided a variety of examples of how to overcome common barriers to financing urban adaptation and resilience. From city case studies to the support tools of intermediary organisations to the efforts of global multilateral institutions, the discussion suggested that a lot of effort is put into funding and supporting the design and structure of projects. In many cases, however, the funding of implementation and execution are left out. It is hard to know whether this is because projects are underdeveloped, or whether it relates to the complexity of adaptation, which not only requires technical solutions but is delicately connected to social and economical structures. 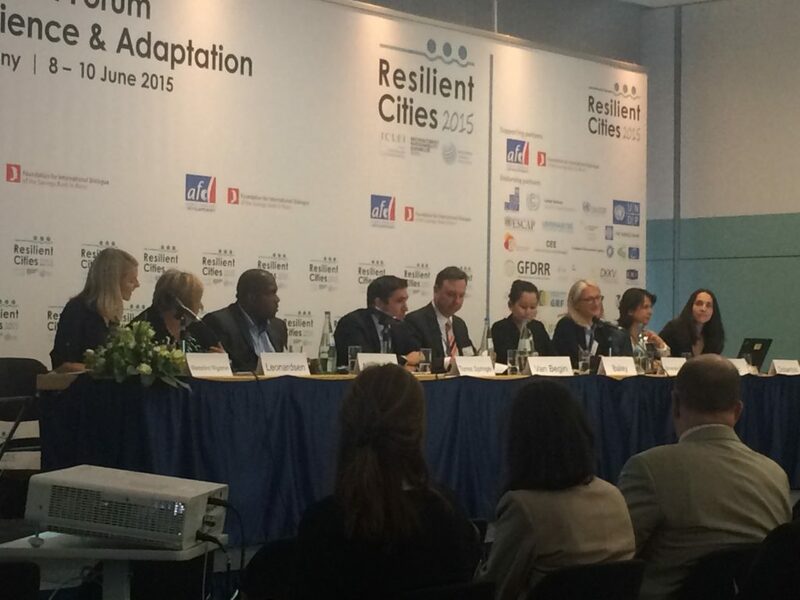 Three city case studies each offered a perspectives on the challenges for financing urban adaptation and resilience. Lykke Leonardsen (Head of Climate Unit, City of Copenhagen) pushed for the idea of increased taxes to fill the gap. Highlighting the multifunctionality of adaptation projects and thereby creating a positive awareness among citizens could allow a tax to be implemented and accepted, she suggested. Public funding should only be a last resort. Instead, innovation and the creation of value should be in focus. To reduce project costs, self financing projects should be promoted. Springer presented an idea from the East Bank of New York where, after the flooding from hurricane Sandy in 2012, ”new” (valuable) land could be built with commercial funding. The land would also serve to strengthen resilience. Chakil Aboobacar (Advisor to the Mayor, Municipal Council of Nacala-Porto, Mozambique) presented a striking contrast in asking how his city could access international and external funds. The city of Nacala-Porto experiences extreme flooding each year, ”like clockwork”, destrying the banks and infrastructure. In a country where Portuguese is the first language and where there is a high rate of illiteracy, the immediate problem is a communication lock-out. The applications are in English, the rules are in English. The global community of adaptation and resilience and all of its knowledge is in English. The opening panel of the finance forum made clear that the ability to pay and the willingness to pay are two different things. It also highlighted competing priorities, the legal obstacles to direct funding from multilateral actors to cities, and how technical documentation from cities is often inadequate to secure financing. How to unlock investments is a topic that will be discussed further over the course of the congress.